I rode into work today. This is the first time I’ve been on the bike since Thursday of last week. I had a blowout on the way in, but luckily I wasn’t far from a bike shop. I bought a new tire, and was on my way. I won’t be riding home today, as I’m going to an event after work, and riding with a friend. 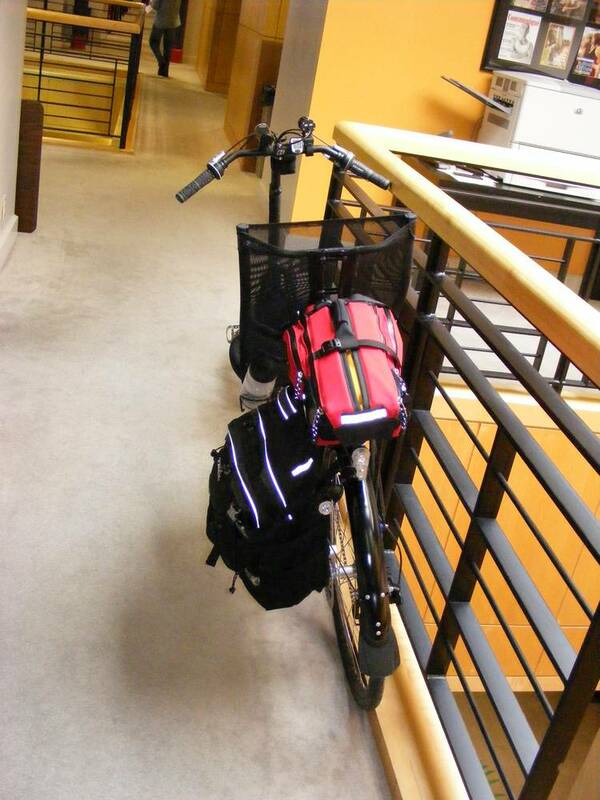 Here’s my bike at work today, with the new fenders, replaced rear tire, and new DiNotte lights. Man.. you’re just a step or two away from going on a tour.. with camping and the whole deal. I wish I had your motivation.. I’m skinny and couldn’t get big if I tried .. but I’ve got tons of things I haven’t done that I probably could if I had your drive… Impressive. .. oh.. and one good thing about popcorn.. it’s big for its calories.. and if you eat it one piece at a time (yeah.. I know.. popcorn works best with a fist-full).. one piece at a time can last a long time. Responsibilities at home and at work can mess with motivation. If you had plenty of time, money, and the blessing of your family you could do it much easier.